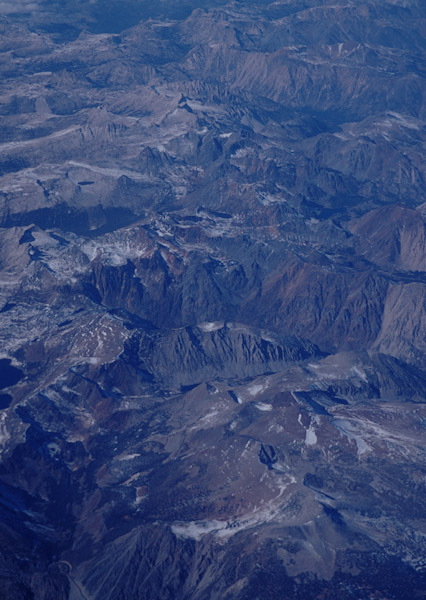 When I was young I often took pictures from the window of commercial flights with my point and shoot. The pictures turned out the way you would expect, low contrast, lots of haze, and in general not very interesting. After a few attempts I gave up and stopped taking pictures from commercial flights. Since that time I have learned a lot about photography and photography has advanced. I decided to try again using 100VS and digital manipulation to see if I could get a reasonable picture from 30,000 feet. 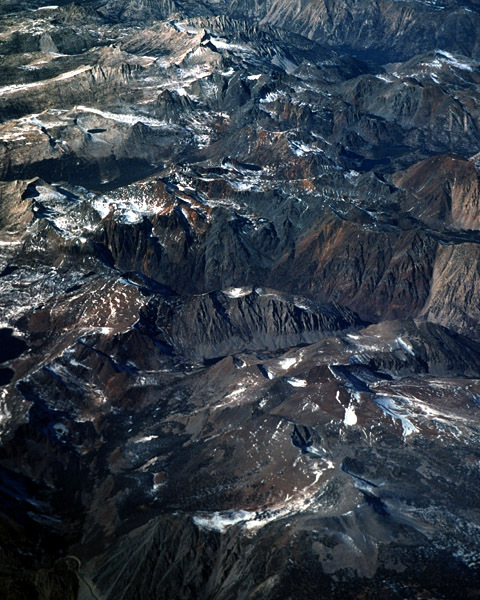 The pictures below I think are from the southern Sierra Nevada taken on a flight from Montreal to San Francisco (the flight was routed south near Las Vegas and that is why I think it is the southern Sierra Nevada). The picture on the left is a normal scan adjusted only for brightness. The picture is what you normally get, low contrast with lots of haze. After a quick attempt with auto levels I realized that part of the problem was that the top of the photograph was much bluer than the bottom of the photograph because the camera is looking through more atmosphere. I ended up creating an additional channel in PhotoShop and then using the gradient tool to create gradient masks to adjust the color and contrast. Two masks were required, one to adjust the top two thirds and one to adjust just the top third. I used levels to adjust the color and contrast based on the assumptions that the granite was nearly gray and the snow was white. In the end I think I ended up with a photograph that looks about right. The sharpness is just ok, and the bottom third of the photograph is blurry, but it makes a decent 8x10.